Bringing our two Kinder doelings home. Back in September 2016 we decided to get goats to help improve our pastures, clear the invasive Himalayan blackberry, and provide milk for our family. After a lot of research we chose the Kinder goat breed because they are dual purpose, small, and have a high milk output. Lucky for us, the Kinder breed was developed here in Washington State, so there were a number of breeders to choose from. On September 18th we brought home two Kinder doelings we purchased from Amy Ackroyd in Northeast Olympia. The Certificate of Registry for the Ellis Creek Farm Kinder herd. We had tons of blackberry along the side of our property. Initially we were unsure of how rotational grazing would work with our two Kinder doelings. 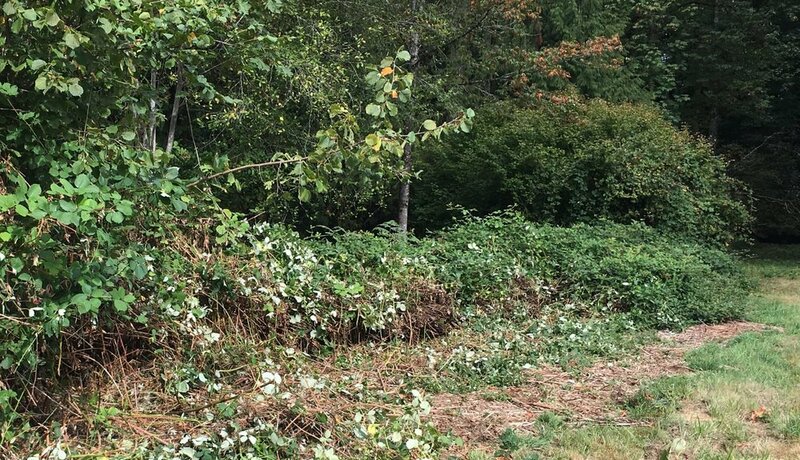 We were looking for a way to help control invasive Himalayan blackberry, so we decided to use Premier1 electric goat netting and enclose them with the canes. We quickly realized that the goats weren't interested in the canes, just the leaves. Pasturing goats in areas with lots of blackberry is difficult! Unfortunately, dealing with electric netting in areas with lots of blackberry is difficult. The fencing constantly got stuck on canes and rotating the goats was very time consuming. We had heard and read that goats were browsers and wouldn’t eat grass. But our experience has shown they they love the taller pasture grass and will tolerate the shorter stuff too. Feeding goats forage is a great way to improve their diet and give them something to do. This led us to change our rotation. We started moving them through the pasture and collecting blackberry to feed them in their stall. Feeding goats forage is a great way to improve their diet, reduce hay and grain costs, and give them something to do on rainy days. Stay turned for a future blog post on forage feeding. We had heard that goats don't do well with electric fencing. We started our goats on pasture, in electric netting, when they were five months old. Goats are very trainable and getting them used to electric fence early in life is the most important step. On the first day in the electric fence Little tried to chew on it and got a shock that she isn't likely to forget. Since then, they make sure to stay a healthy distance away. Electric fence is a mental barrier. They could easily knock it over, but once they learn that it hurts, they stay back. It is critical that the fence is always on when they goats are in it. It also prevents other animals, such as dogs and coyotes, from getting in. Taking the goats out to pasture. The goats quickly learned that they would get grain when being led out to their paddock. Now they know the routine and will head out without much fuss. Putting goats on pasture is not only good for their health, but it is good for pasture health too. The grass provides the goats with extra nutrition, and the pasture gets the added benefits of manure and maintenance. One of our goats relaxing in the PolyDome. We typically leave our goats in the pasture for 4-6 hours a day. Approximately every 3 days (depending grass length, wetness, etc.) we move the fence to a new spot. We use a PolyDome calf nursery as a portable shelter for the goats. We just roll it over to the new spot when we move the fence. It gives them some extra protection from rain and wind. Although we have permanent housing in the barn for our goats, in our mild climate they could be kept in the pasture year round. They would still need access to mineral and water. Depending on how much grass and forage there is for them to eat, supplemental hay and/or grain would need to be provided. Our goats in their stall seeing snow for the first time. Stay tuned for a future post about how we rotate the goats, how we forage feed the, and our stall layout.